Improving misaligned teeth and noticeable smile gaps is easier than ever with our state-of-the-art orthodontic options here in Plymouth. Dr. Atsalis offers both aesthetics-friendly Invisalign and lightning-fast Fastbraces® so that patients can achieve their best look in ways that fit their personal needs and preferences. To get started, contact Atsalis Dental Excellence and schedule a braces consultation! If you’re concerned about the idea of wearing noticeable metal braces, Invisalign may be the right orthodontic option for your smile. 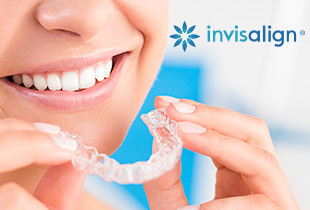 Instead of brackets and wires, patients are provided with a series of clear aligners that are designed with your unique mouth in mind for optimal comfort. When worn, these aligners are very subtle and barely noticeable; they’re removable as well, which means you can enjoy all your favorite foods and brush and floss like normal throughout treatment. The patient’s only job is to switch them out as directed and attend brief checkups here in Plymouth. Traditionally, braces can take multiple years to be effective, which isn’t good news for patients who aren’t a fan of wearing metal brackets and wires in the first place. Thankfully, Fastbraces® is a new and revolutionary system that’s perfect for patients who consider speed to be a priority. Traditional orthodontic systems have two phases – they move the crown of the tooth, and then they shift the root to match. Fastbraces® works so well because it starts shifting your tooth root on day one, saving valuable time. It also uses a triangular bracket that greatly improves the flexibility of the wire. With this state-of-the-art approach, many patients are able to achieve significant and beautiful smile improvements in as little as 3 months!